, originally uploaded by Mike_n_Kat. 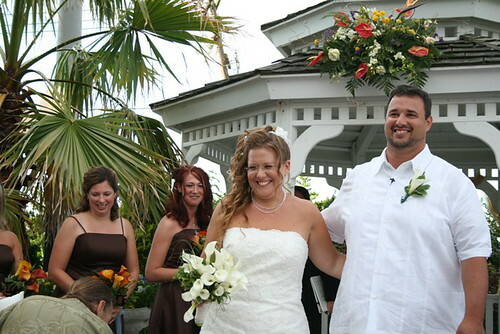 Mike’s cousin Brian got married to his long time girlfriend of 13 years Melissa. This was one of the favoirte weddings. Some of the highlights was that they entered the reception on a boat, then entered the reception room to Kick Start my Heart! There was also tons of delicious foods. The chocolate fountain was one of my favorites. 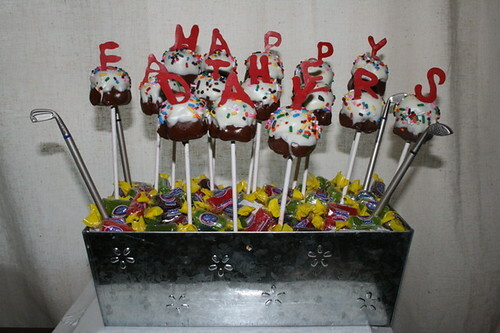 Happy Father’s Day cupcake pops, originally uploaded by Mike_n_Kat. I made these cupcake pops for Father’s day. TO-DO List, originally uploaded by Mike_n_Kat. 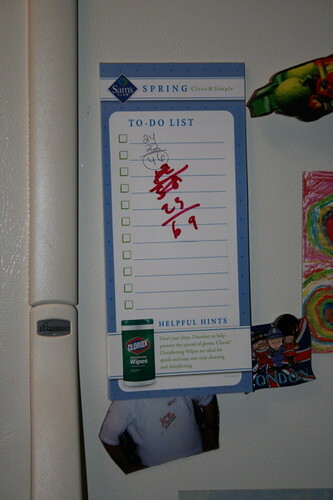 Holy Moly I went to go get some choco milk I ran across Kat’s TO-DO List. this weekend looks promising. Mango, Crab, Beach, and Nascar! My Bday Cake!!! 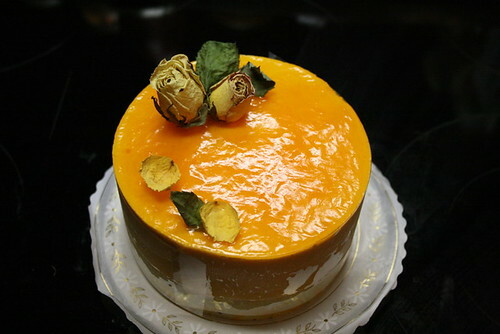 Yummy Mango Mousse, originally uploaded by Mike_n_Kat. So far my birthday month has been great. It first started this past weekend with a surprise trip to Cancun for my brother who’s bday is 4 days after mine that his wife organized. We had a great time hanging out at the pool overlooking the beach, eatting tons of food, and seeing a little of Cancun. Then today I had lunch with my cuz’ who shares the same bday. There is 3 of us in the same family with the same bday! For diner we went to Red Lobster since I wanted King Crab for diner! To end the night Mike’s mom bought me a yummy mango mousse cake. The celebration will continue this weekend in Charlotte for the NASCAR all star race. Usually I only celebrate my birthday on one day but this year I have been blessed with celebrating it for the entire month with my favorites. Maybe next year I can go to a Nascar race on the beach, while I eat some crab, corn on the cob and mango! Stars & Stripes, originally uploaded by Mike_n_Kat. Today we went to the Sunrise Community Hot Air Balloon Race at Kendall Tamiami Airport with Mike’s mom, and brother. We got up extra early for this event. The balloons were schedule to be launched at 6:30am. It seemed that the weather condition was not in the favor the balloons. Many balloons drove to a location and flew back in to the target. 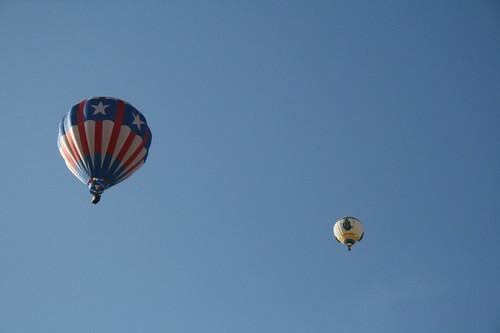 Some balloons stayed in the field and allowed people to take a quick ride in the balloon. I heard yesterday mornings launch was better. Next years I will try to go to both. It was a wonderful morning watching the sunrise and enjoying the hot air balloon event. This event will defintely be on my yearly to do list!! Once a Crue fan, always a Crue fan! 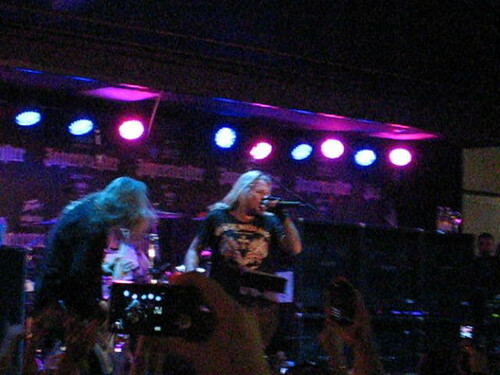 Vince Neil @ Dr Feelgood Bar opening in West Palm Beach, originally uploaded by Mike_n_Kat. I can admit that I haven’t been following the band for a couple of years. When Vince Neil opened Dr. Feelgood bar I was extremely excited. He had a free concert on the streets of West Palm Beach near the bar for their grand opening in January. It felt like the good old days of standing up front waiting for the band to appear. Man, after a couple of hours I realized that I am not as young as I useto be. I still stood there in the same spot for hours until Vince appeared. He opened with full force with Live Wire. The band wasn’t too hot but Vince rocked the house. I can’t wait for the concert in July!! I wanted to share a part of an email that a colleague sent out in preference to a bug that we were having in our software. This person stated that he found the fix for the bug and it was simple. He also cc’d all the big bosses. Keep in mind his first language in not English but surely speaks it well. I have only one problem left: How to teach the colleagues to find this kind of errors fast? I always write how I find the problems but this doesn’t seem to be enough. Any help on this is appreciated. Ok, I added the XOXO. So is he saying we are stupid? slow? or just plan don’t get it? Or he is not a good “Teacher”? Banana bread, originally uploaded by Mike_n_Kat. This was the second recipe I tried last night. It was much better than the first but I am still bananas over banana bread! 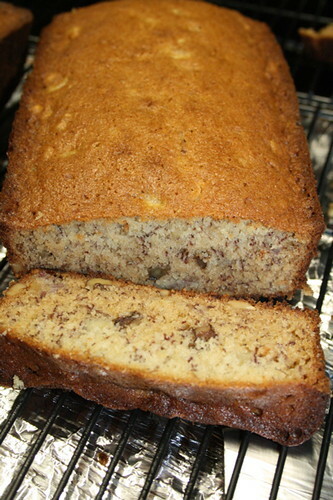 I remember having banana bread when I was younger from Jamaica that was very tasty with a nice crispy top. BTW.. To both of the recipes I added walnuts and fresh grated nutmeg. Banana bread recipe, originally uploaded by Mike_n_Kat. Got home from barcamp and all the bananas were over ripe. 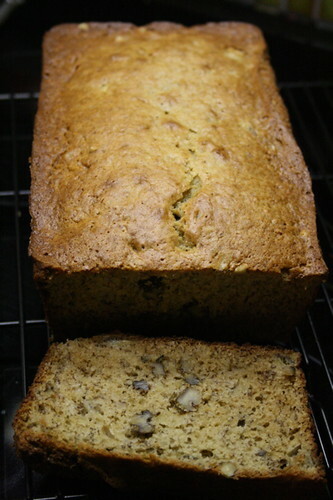 So what else can you do with a bunch of bananas besides make banana bread? The first recipe I made I found on Recipezaar http://www.recipezaar.com/50022. This recipe made 2 loafs. I probably baked it a little bit too much. But this recipe is not as tasty as others that I have tried. I will keep looking for more recipes to try out. I was not too happy about the 3/4 cups of butter!! 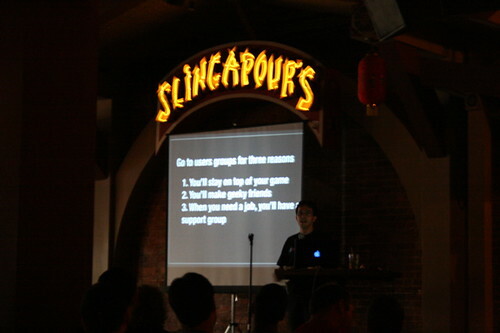 Gregg’s presentation, originally uploaded by Mike_n_Kat. When to barcamp orlando at the Wall Street Plaza with Mike, Jules & Fanless. Saturday was geared to developers and Sunday for media. Saturday was a huge turnout and Sunday was a 1/2 the number of people. We enjoyed many of the presentations and I learned some new things too. This was defintely was a great weekend. We attended the Izea party after Saturday’s barcamp. They have a pimped out office. I heard there is about 35 employees and they are looking to grow to 100 by the end of the year. They had several rooms with gaming systems setup for the party and an open bar. Mike was able to play guitar hero with some fellow barcampers. Later on Saturday night we went to the 40 watt club to see Tokyo Police Club, Eagle Seagull, and Summerbirds in the Cellar. The bands put on a pretty good show. The venue was pretty small but the sound was awesome. Downtown Orlando that night seemed very happening. After this weekend we have a better feeling about downtown orlando! Thanks to barcamp orlando for bring us to the area. We defintely will be back. There are 54 posts and 43 comments so far.